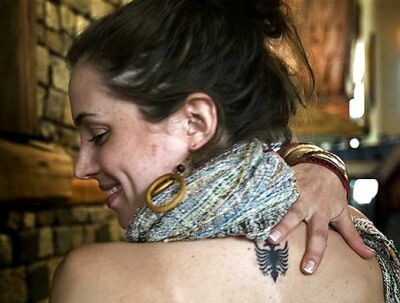 A double headed eagle has turned out to be a ‘tru calling’ for the U.S. actor Eliza Dushku who tattooed the design on her back. Eliza commemorated her first visit to her father’s homeland by marking the design inspired by Albania’s national flag. Although the stunning tattoo she sported in ‘the Buffy the Vampire Slayer – Faith’ was a fake, as shown in the image above, but this one is real. Dushku’s visit had a great impact on her personality. I’m flattered and taken aback, and yet it makes me want to be even louder and prouder Albanian. It’s very emotional. There’s so many emotions running through my soul, my mind and my heart.